This is a UC 2 extract of Kanna. In low dosages it provides a stimulating effect, in high dosages it has calming properties. UC2 extract can also be added to food, for example mixed into chocolate. Kanna UC2 extract is a more concentrated kanna extract just like UC, but with a slower onset and longer-lasting effects. Kanna UC2 is best mixed in with food. It’s slow to produce effect but the effects remain active for a long time. 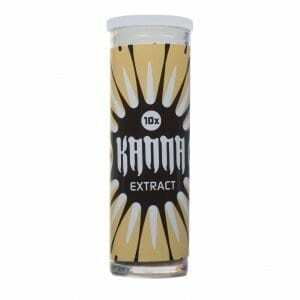 Kanna UC extract on the other hand is best used as a snuff, the effects come up rapidly, are very intense, but don’t last as long. Enjoy the relaxing and socially stimulating buzz. Kanna is a South African narcotic plant also known as Sceletium Tortuosum. Its relaxing property was discovered by the Hottentots (Khoikhoi) over 300 years ago. The tribesmen would chew or sniff kanna for pleasure. There are several ways to consume this extract, but we recommend either mixing it with food or encapsulating. One gram is sufficient for 5 to 10 dosages at 100 mg (light experience, recommended dosage) or 200 mg (strong experience). Sceletium Tortuosum is a Selective Serotonin Reuptake Inhibitor (SSRI). It should not be combined with other SSRI’s (Seroxat, Prozac) or Mono Oxidase Inhibitors (MAO-I), such as Syrian Rue (Peganum harmala), Banisteriopsis Caapi, Passionflower (Passiflora incarnata), Yohimbe, and certain anti-depressants.